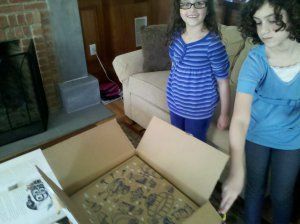 My daughters wanted to know what was in the box when we opened it on April 14, but I knew immediately what it was. I had been hoping since I had filled out the form for the pilot program, that I might receive aChromebook. I'm sure you will agree that there's nothing like unboxing a new computer. They're so clean and pretty and they are a blank canvas. Usually, the first thing that I do with a new laptop is install my must have apps like Skype and Tweetdeck. But the only installs on this laptop were going to beChrome Apps. I knew I wanted to take it with me to theNJECCmeeting the following day, so I spent about 30 minutes checking out a few things making sure it was ready to go. The next day at the meeting, I had some more time to look into things. (Yes, I was multitasking.) I foundTweedeck andDiigoin the Chrome Apps store. I also realized there was no way to take a screenshot from the keyboard, so I installed ascreenshot app as well. So, just over a month later, news has come out thatGoogle will be leasingout these computers. You can read about ithere. There is some skepticism about this hardware that you can read abouthereandhere, but on the whole, reviews have beenpositive andhelpful. I'm enjoying it and so are the other four users that have accounts on it.